Four Dimension Technologies and Coordinate Systems is pleased to announce a special GeoTools promotion campaign valid only in India, starting today until December 31, 2010. Offer valid on a single-user license only. For additional licenses, simply multiply the number of licenses by 5000 Rupees to arrive at your price. Offer valid until December 31, 2010 only. Offer valid on both AutoCAD and Bricscad versions of GeoTools. In my last post, we announced the release of Bricscad V11. Today, we are pleased to announce the release of GeoTools 11.07b update which is compatible with Bricscad V11. No new license file is required for you to continue using your GeoTools on Bricscad v11. If you are using a GeoTools verison prior to V 11.07b, it would produce an error upon startup in Bricscad V11. This update fixes the problem. Download GeoTools V11.07b fix here: English, Spanish, German and Russian. Highly compatible with DWG 2010 file format. Support for DWG versions 2.5 to 2010. Full ACIS (3D solids) modeling (Windows only). Visual Basic for Applications (VBA) (Windows only). Fast LISP engine with +450 VLAX functions support. Highly compatible ADS/SDS API (Windows only). Highly compatible COM API (Windows only). As you can see from the list above, a completely new Rendering Engine, support for use of Dynamic Blocks, PDF underlays are some of the key features. Support for large DWG files: Another important discovery I made during my tests is that Bricscad V11 opens large DWG files much more easily than Bricsad V10. Opening a 245 MB DWG file in Bricscad V10 used to be a Herculean task; it can be done without any performance issues in Bricscad V11. This is bound to bring relief to a large number of users who have been facing difficulties when working with large DWG files in Bricscad. Feel free to share your Bricscad V11 experience. This week, we will show you how to join points in a specific order, sorted based on their coordinates. The GT_SORTEDPOLY command in GeoTools (GeoTools -> Draw -> Draw a polyline by joining points in sorted order) helps you achieve this. You select a set of points or blocks and specify the order in which you want the points to be joined. The order is defined as +X, -X, +Y and -Y which specifies the sorting order to follow. +X sorts in ascending order of X coordinates while -X sorts in descending order. This is a simple tool and needs no further description. The two screenshots below shows the results obtained by running this command on a data sample of points with different sort parameters (+X and +Y ascending). 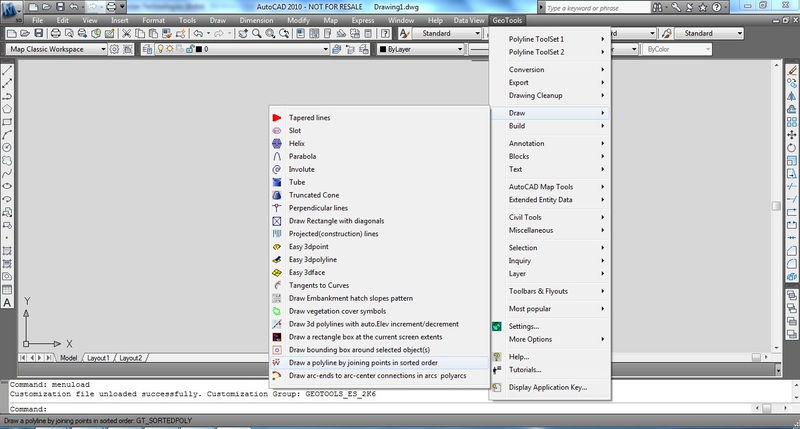 The tool shown above works in both AutoCAD as well as Bricscad versions of GeoTools. 1. GeoTools V11 (running in trial mode only, not licensed versions) was causing an unexplained freeze in AutoCAD 2011 and the only way out was to shut down AutoCAD. This has now been fixed. We apologize for the inconvenience this has caused to all our AutoCAD 2011 evaluation users. 2. In AutoCAD versions 2009 and above, GeoTools now makes the AutoCAD menubar visible by default upon startup. This has been done using the MENUBAR system variable in AutoCAD which is set to 1 upon GeoTools startup. Tip: In the event that you do not see the AutoCAD (and GeoTools) menubar at any time, type MENUBAR on the command line and set the value to 1. 3. Some commands in GeoTools were incorrectly displaying a message "There is no license to run this command". This bug sneaked in during one of the earlier updates. This has been fixed now.